I have always loved spring, and all of the things that come with it. Warmer weather, fresh flowers, beautiful landscapes and fun in the sun. I especially love all of the great colors and fabrics that we put our babes in for the season! Greens, blues, pinks, and yellows are so cute on kids, and really brightens up their wardrobe after the dull and dark colors of winter. Boys and girls both look so adorable and much more comfortable in cottons and light knits in cool colors and designs. Zubels sent me this great outfit for David, and he is going to wear it on Easter Sunday for church and a family party. He already looks at it and says dinosaur in his own way of course. The fabric on this outfit is so soft and feels wonderful against your skin. The details of the pocket on the shorts is just so neat. Zubels also sent this neat little dress with bloomers for my new granddaughter. I remember my mom making little dresses with bloomers like this for all of the new babes, and it takes me back to a simpler time. I love all of the different gingham colors and prints, they go so well together. Zubels also has so many adorable hand knit toys for little ones that are soft and plush with all of the details sewn on, so you have no worries about buttons or bobs falling off or becoming a choking hazard. 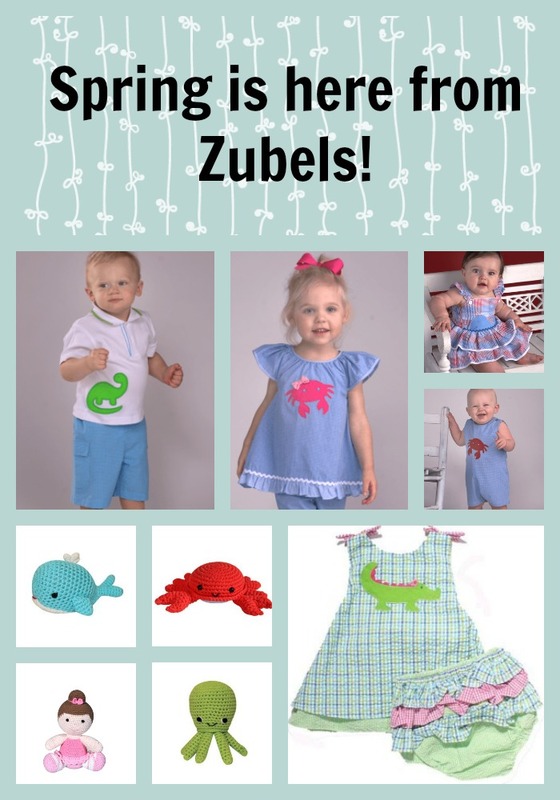 If you have a newborn to toddler Zubels has just what you need for Spring to come alive for their wardrobe and toys. It is amazing how many great outfits and toys they have a available for little ones in this great season. The dimple toys from Zubels offer so many advantages over hard toys. The crochets texture with dimples is awesome for little ones to feel for sensory development and they are the perfect size for them to fit in their mouths to chew on but with no worries of choking. Little babies love all of the bright colors and different parts to these toys and toddlers and even preschoolers love to play with them as well. All of them are 100% cotton, dyed using eco-friendly and non toxic dyes. One of the things that make me feel safe about using these toys for little ones is they have been safety tested to exceed Consumer Product Safety standards. You can get a sweater, rattles and other ballerina toys so you have a matching set for pictures or gift giving. I have to say that I love having lots of these little toys around as they are machine washable and you just roll them in a towel to get the excess water out and they dry really quickly. I can’t tell you the number of times that I have had to wash toys after being dropped on the grass or floors places. Zubels has your Spring Season wrapped up for you and your baby, and with all of the baby showers coming you will have the perfect go to place to get everything you need. While shopping at Zubels you can use coupon code SM20.